The women’s basketball team took their twelfth straight win with a 74-61 win over Saint Leo. Saturday’s home game was also Senior Night, with Seniors Tanaya Jones, Brittany Betts, and Marie Gilbert receiving recognition for finishing their last regular-season basketball game. The first quarter was close, with the Tars only leading by two points, 19-17. At the end of the second quarter, the Tars still led by only two points, 38-36. The Tars began to pull ahead after halftime. At the end of the third period, the team had a 8 point difference of 53-45. The Tars capitalized on their lead and finished with a win of 13 points. Rollins’ stand out player was Senior Marie Gilbert. She scored 17 points, with 6 rebounds, and 3 assists. 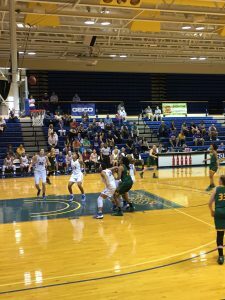 For the Saint Leo Lions, Chelsy Springs had an amazing game, scoring 30 points and 11 rebounds, but her performance was not enough to make up for Saint Leo’s lower scoring accuracy than the Tars throughout the game. It was announced Saturday night that the team will enter the Sunshine State Conference at the number three seed. According to Rollins sport’s website, the team lost a coin flip for the number two seed position. Rollins will host Florida Tech for their quarterfinal face off. Micah Bradley 17' is a native of Nashville and an English major at Rollins College. She has other published work with <a href="http://nashvillepublicradio.org/blog/author/micahbradley/">WPLN Nashville Public Radio</a>.